Brown, The New Green Award – Jeff Brown - “Some of the greatest teachers on Earth are the kids we teach. As we strive together to create a sustainable environment for tomorrow, I am more optimistic than ever. With our youth leading the journey, I know that our Earth will be a better place for future generations,” said Jeff Brown, teacher of the gifted and talented at Thomas Jefferson School (T.J.) in the Morris School District. 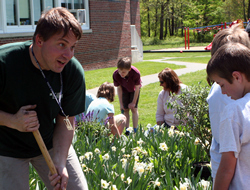 Now some kudos for Jeff, the teacher who has played a major role in promoting sustainability at T.J. 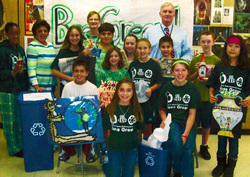 In 2007, a group of fifth grade talented and gifted students created an organization called Save The Earth…Save Our Future. Jeff has worked with those students, some of his colleagues and others to organize two environmental fairs and to produce a documentary focusing on sustainability in Morristown. The students met with filmmakers, researched, wrote scripts, revised and revised, and raised roughly 70% of the money to fund the $4,000.00 project. Sealing The Lid On Waste Award – Bruce Gerritson, Hishi Plastics, Lincoln Park - “We’ve gone from 10 tons of garbage monthly to .77 tons a month. We’re now recycling more than 90% of what we used to throw away. My hope at the end of the day is that each employee has learned from our example and makes the same effort at home,” said Bruce Gerritson, plant manager at Hishi Plastics USA, Inc., in Lincoln Park. On December 1, 2009, a load of garbage containing an excessive amount of corrugated cardboard was dumped onto the tipping floor at the Parsippany Transfer Station. That corrugated was from Hishi Plastics, a manufacturer of seamless heat-shrinkable polyvinyl chloride rolls, neckbands and multi-packs for food and medicine bottles. Immediately after receiving a phone call from the MCMUA regarding the fact that corrugated is a mandated recyclable material, Bruce Gerritson, plant manager, not only straightened out the corrugated situation but also ordered containers for other mandated recyclables. Those containers are now located throughout the Hishi building. Bruce has also requested that employers drink from reusable beverage mugs rather than disposable ones, and he’s even purchased coreless rolls of toilet paper ─ just two more ways he’s sealed the lid on waste! Emerging From The Chrysalis Award — Kevin Mackey and Tom Piorkowski, Lincoln Park - “Lincoln Park has managed to turn blue and yellow into green. 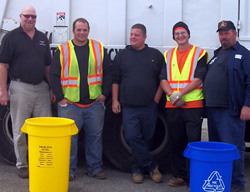 By providing residents with colorful blue and yellow recycling containers, Lincoln Park has managed to reduce its solid waste by almost 25%, “remarked Tom Piorkowski director of the Lincoln Park Department of Public Works. 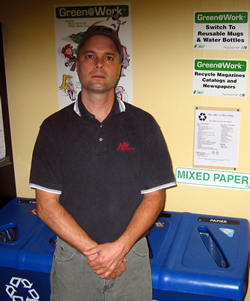 As a result of a study conducted early in 2009 to determine how to lower Lincoln Park’s tipping fees for garbage, both Tom Piorkowski, and Kevin Mackey, Lincoln Park recycling coordinator, made changes at the recycling center related to the wood dumpster, along with changes related to the collection of brush. In addition, they oversaw the implementation and launching in October 2009 of a comprehensive curbside collection program for bottles, cans and paper (once upon a time, Lincoln Park collected newspapers at curbside). Residents were the lucky recipients of stickers to match their blue and yellow containers (the carrot). Fluorescent orange violation stickers with the following message were ordered, just in case: “Recycling is Mandatory, Violation. Your trash contains recyclables. This container will not be picked up until those items are removed…” (the stick). “Tom and Kevin do all the nitty-gritty work ─ they’re great at it,” said Sean Canning, Lincoln Park administrator, about that bright blue and yellow butterfly that has indeed emerged from the chrysalis. 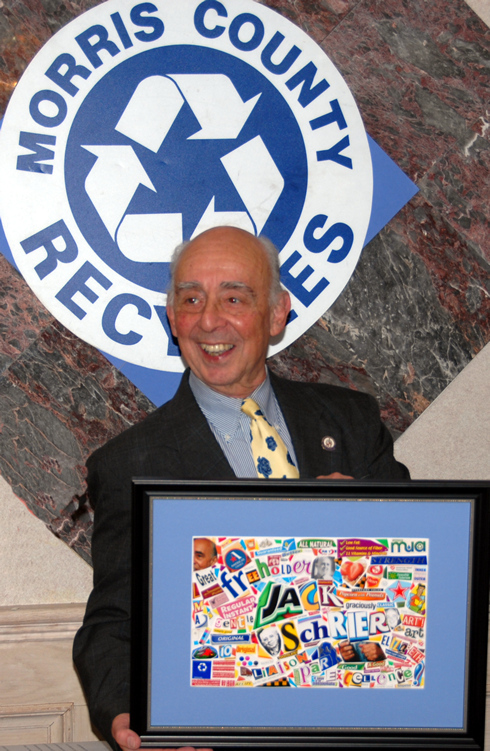 Making Recycling Everyone’s Business Award — Greg Pavlic, Parsippany - “I believe the issue of recycling is straightforward. While we wonder why anyone could possibly throw mandated recyclables into the garbage, we take steps to prevent that from occurring. We discuss with businesses how recycling helps the environment, benefits Parsippany through recycling tonnage grants, and results in lower tipping fees. The most important thing we say, though, is that recycling is the law!” said Greg Pavlic, Parsippany recycling enforcement coordinator. Greg has visited quite a few businesses that have received notifications about the need to recycle from the Parsippany Transfer Station, to assist them with getting on track. He completed recycling status reports for the 14 schools in the Parsippany Public School District and followed up with those schools when necessary. Also, after a load of bottles and cans that were generated at Smith Field showed up at the transfer station, Greg had new recycling containers and a dumpster delivered there, resulting in significant improvement. Greg may be the number one dumpster diver in Morris County! 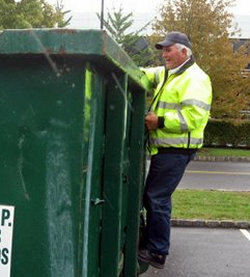 In this photo, he’s checking out the roll-off designated for corrugated cardboard at the Residence Inn in Parsippany. Rags Into Riches Award — Harrison Richlin, Mount Olive High School - “When I went to find my lost sweatshirt, I saw the mound of unclaimed clothes and other items. I was shocked that no one cared to retrieve them! Then I got to thinking – there are so many people who are not only homeless and without food, but they are also often without clothing. I’m lucky – I can just go shopping when I need clothes. It hit me that these forgotten clothes could mean warmth and comfort for others. They don’t just have to be discarded. I was excited to think that I could HELP put them into the hands of those who could really appreciate them. When I met some of the people who would benefit from the clothes – I felt wonderful for a moment, but I also knew that this was just the tip of the iceberg – there’s so much more to be done on so many levels,” said Harrison Richlin. Harrison’s journey began when he, an eighth grader searching through the lost and found bin at Mount Olive High School for his sweatshirt. He didn’t find it but instead found a calling that involved his creating Harrison’s Enterprise for Lost Paraphernalia (HELP). He contacted numerous area schools, offering to pick up the contents of lost and found containers. Several schools took him up on the offer (he collected from about 12 schools during the 2009-2010 school year). After collecting them, he took items home to his parents’ garage, sorted them, bagged them and gave them to the Market Street Mission in Morristown where they were on their way to local homeless and needy folks who can use them. 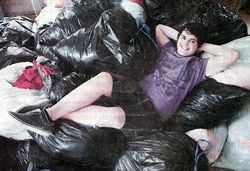 In this Star-Ledger photo, Harrison Richlin is reclining on top of bags of items that were lost but now are found. Recycling, Like Honey, Is Sweet Award — Dennis B. O’Brien School, Rockaway Township School District - “The Dennis B. O’Brien Elementary School worked together to accomplish a goal that was set at the beginning of last school year. The faculty and every student became so engaged and committed that the enthusiasm to ‘bee’ green turned into a passion for recycling and saving planet Earth,” asserted Daryl Behm, art teacher. Turning Aluminum Into Bronze Award — Hanover Township Girl Scout Troop 419 - “The positive impact made by 15 fifth grade Girl Scouts at Salem Drive School in Hanover Township was amazing! Their success is recruiting more than 60 of their fellow fifth graders to collect aluminum can pull tabs was measured not only by the number of tabs collected but also by the energy created as the students worked collectively towards the common goal of using recycling to benefit others,” stated Mary O’Connor, co-leader of Troop 419. Under the leadership of both Ms. O’Connor and co-leader Diane Wachenfeld, the scouts organized the 5th Grade Aluminum Can Tab Contest to see which of the three fifth grade classes could collect the most tabs during March and April 2010. They created and hung up posters in the school hallways, decorated (and thereby transformed) 60 used tissue boxes into colorful, convenient tab collection receptacles, one of which was given to each student to take home. They placed large plastic pretzel containers in each classroom, and transported the tabs in reusable shopping bags to Ronald McDonald House (RMH) in Long Branch. And they left the bags for RMH guest families to use. The scouts also made floral centerpieces and other decorations for a Mother’s Day celebration held at RMH. At the conclusion of the contest, each fifth grader received a voucher for free ice cream, and the winning class was awarded a pizza party. As a result of completing this project, Troop 419 scouts earned the Girl Scout Bronze Award, the highest honor a Junior Girl Scout can achieve. 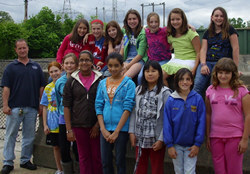 The Girl Scouts gather for a photograph during their tour of the Hanover Township Recycling Center provided by Brian Foran, superintendent of the Department of Public Works. The tour was related to their aluminum can tab collection service project. Welcome Home, Native Bird Species! Award - Morris County School of Technology, Denville - “This community outreach project provided our students with a great opportunity to see practical and measurable results from their labor. 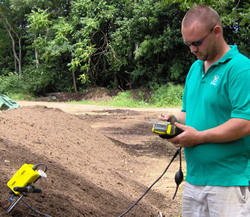 Many times our outreach projects produce usable goods, and that is great, but this time there was a real ecological connection that brought student learning to a new level,” affirmed Bruce Feakins, building construction teacher at the Morris County School of Technology (MCST). 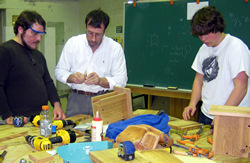 Bruce Feakins takes advantage of a “teachable moment” as he shows three students working on bird boxes how to use a compass to mark the access hole. (Bruce said in reality, use of the compass wasn’t necessary because the students just used the correct size drill bit with the center marked. A female Eastern bluebird standing on top of one of the bird boxes made by MCST students, holds in her beak a reed that will be used in the nest she is constructing. Her male companion, who will supervise the construction, (ahem…), is next to her. When Brian Jacobus, Morris County environmental specialist, wanted to have some bird boxes constructed for Emmerich and Stull fields (on Park Ave. and Righter Rd. in Randolph, respectively, both of which are located in the Alamatong Wellfield), he reached out to three area schools. MCST responded, expressing interest in making some boxes for secondary cavity-nesting birds (e.g., Eastern bluebirds and tree swallows), wood ducks and bats. The building construction students then went to work. 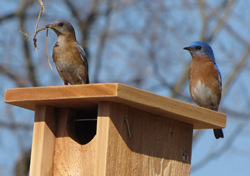 Early this past spring, eight bird boxes were erected at the two previously mentioned fields; shortly thereafter, the swallows inhabited six of them, Eastern bluebirds, two. The bird box project was undertaken as part of a restoration effort for the fields that included removing invasive plant species, sowing warm season native grasses and wildflowers, and planting native saplings. That effort resulted in a more attractive habitat for wildlife, as well as a better place to filter stormwater runoff and an overall enhancement of Morris County Open Space property and water quality. Note: The boxes for wood ducks and bats will be erected at a later date. The Best Choice Award — Ag Choice, Andover - “We are so excited to be the first on-farm composting operation permitted by the New Jersey DEP to accept food waste and animal manure for composting. We are even more excited that our small-scale operation has responsibly transformed more than six million pounds of organics into our organic-approved compost and/or an alternative animal feed. Keeping these recyclables out of landfills helps reduce water pollution and greenhouse gas emissions, and preserves valuable landfill space,” said Jill Fischer, co-owner of Ag Choice. 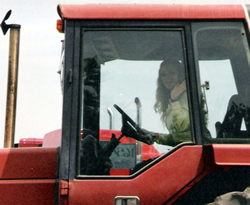 Jill and her husband, Jay, started Ag Choice in the summer of 2006 to compost horse manure. Currently, Ag Choice collects and composts the following organics: 1) agricultural waste, such as animal manure and bedding materials, spoiled hay and corn silage, 2) pre-consumer food waste, such as bakery byproducts, fruit and vegetable culls, and floral waste, 3) and manufacturing waste, such as certain plant-based manufacturing organics. Ag Choice accepts pre-consumer fruit, vegetables, bakery goods and floral clippings from two Morris County supermarkets: the Wharton Costco and the Succasunna Shop Rite. Bagged Ag Choice Humus Compost is available in the Byram and Newton Shop Rite stores. The Northeast Farming Association (NOFA) of New York and New Jersey has approved Ag Choice Humus Compost for use in organic production. If It’s Rechargeable, It’s Recyclable Award — Rechargeable Battery Corporation - “New Jersey was one of the first states to tackle rechargeable battery recycling with Call2Recycle®, and our partnership with the Association of New Jersey Household Hazardous Waste Coordinators (ANJHHWC) has helped divert hundreds of pounds of batteries from reaching incinerators and landfills. We are proud to be a part of helping keep New Jersey communities cleaner, and we are happy that residents and retailers in this state are setting a wonderful example of how it can be done,” said Todd Ellis, Northeast regional account manager, Call to Recycle®. 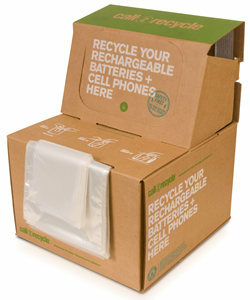 Call2Recycle®is a free collection program for rechargeable batteries and cell phones. Currently, Home Depot, Lowe’s, Radio Shack and Verizon Wireless participate in Call2Recycle® (C2R) at their retail locations. C2R provides drop-off boxes with small plastic bags, allowing batteries to be individually bagged in accordance with the relatively new U.S. Department of Transportation regulations. The Rechargeable Battery Corporation pays all costs associated with providing drop-off boxes, including transportation and recycling. 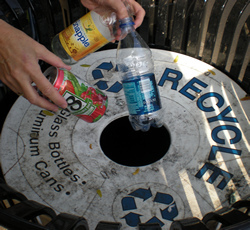 Any non-residential entity can sign up for C2R online at http://www.call2recycle.org. 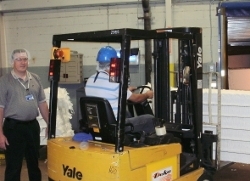 To find the closest public C2R drop-off, one may call 1-877-273-2925 or visit the Web site above. Green To The Last Drop Award ─ Rockline Industries, Montville - “Rockline Industries is a global, world-class manufacturer of premium quality products, specializing in wet wipes and paper coffee filters that takes great pride in our green/sustainability initiatives. In an overall effort to achieve our corporate goals, a global steering committee with representatives of our four U.S. plants and England meets monthly to discuss opportunities for continuous improvement and to share best practices,” said Steve Bende, production operations manager. In the hoto to the right, Steve Bende stands in front of scrap coffee filter paper that is baled and tied (1,200 one-pound bales) and then shipped back to the paper mill to be recycled in the manufacturing process. The Montville Rockline plant recycles over six million pounds of coffee filter paper annually. The follow-up from those monthly meetings has certainly resulted in success, for the Montville facility that solely produces paper coffee filters has a current recycling rate of 98.1%. Over the past three and a half years, Rockline has reduced the trips o its 40-cubic-yard dumpster to the transfer station from once a week to once every 12 weeks. Rockline recycles laser jet cartridges, plastic film/stretch wrap, broken/damaged pallets, waste oil and discontinued raw materials in addition to bottles, cans and paper. In addition, the company sells the following directly to end markets: baled paper such as scrap coffee filters, corrugated cardboard, office paper and magazines, along with paper roll core on which raw materials are shipped, and scrap metal. In addition, Rockline has installed large fans on the production floor to maximize heat created during the manufacturing process and to minimize HVAC energy consumption. They are also exploring ways to decrease the amount of wastewater generated at the facility. “Even if you’ve never heard of Rockline, your mornings would be less fulfilling without their product,” observed Adam Brewer, Montville recycling coordinator. A Step Ahead Award ─ Town of Morristown - “Being given the honor to serve as the Mayor of Morristown, I have been entrusted with the responsibility to serve in the best interest of not only current residents and visitors but also the many generations that will follow. Approaching our municipal procedures, policies and planning through the principles of sustainability ensures that we make decisions based on what is best for our people, our planet and our community’s prosperity. I consider recycling and being a waste-wise consumer as key actions and critical responsibilities to ensuring the health of our overall society and the planet we together call home,” stated Timothy Dougherty. “Step Ahead Morristown…was a Dodge-funded [Geraldine R. Dodge Foundation] initiative that started a town-wide conversation in 2007 about the kind of place that residents want Morristown to be. 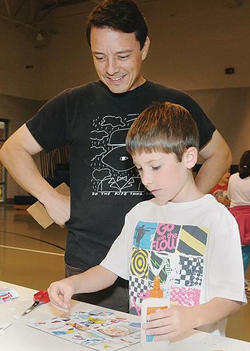 Expert planners visited Morristown and solicited ideas from people of all ages.” ─ www.MorristownGreen.com home page. So much has occurred since 2007. Step Ahead gave birth to Sustainable Morristown, a coalition begun by four collaborators: Town of Morristown, Morristown Partnership, Institute for Sustainable Enterprise at Fairleigh Dickinson University, and Inspired Futures Campaign of the U.S. Partnership. Critical partners are the Geraldine R. Dodge Foundation, Design for Social Impact, and MorristownGreen.com Coalition members are Arts Council of the Morris Area, County College of Morris, Morristown Neighborhood House, and Homeless Solutions, Inc. What an impressive list! This past spring on the Morristown Green, Celebrate the Earth was held on April 22, the 40th anniversary of Earth Day, followed by Festival Earth! on May 22. Of great interest to the MCMUA is the fact that Morristown recently paired up containers for bottles and cans with containers for trash in its business district, which has helped to make downtown a cleaner place. Also, both Charles Jones and Rick Wise, Morristown Department of Public Works employees, have been proactive enforcers of the town’s mandatory source separation and recycling ordinance. 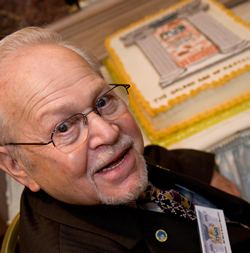 Special Recognition Presentation of the MCMUA Resolution Honoring Herman (“Hy”) Nadel, A slide show featuring 18 Awards Dinner sheet cakes baked and decorated by Hy was shown. An announcement regarding the Hy Nadel Creativity Award was made and the first annual Hy Nadel Creativity Award was presented to the MCMUA's own Liz Sweedy. She was recognized for all the activities she has created for the MCMUA and especially as it relates to preparing and decorating the banquet hall, display unit and mannequin for the MCMUA's annual recycling awards dinner. Thinking Outside The Box Award ─ Michael Albert, Artist - “I believe that I have a passion for what I create with post-consumer materials because I have a passion for creating art. It’s one of my favorite ways of expressing myself and my thoughts, and also of connecting with the world. Since the images I take from packages are all so recognizable, other people (total strangers) can immediately connect with the images by recalling where they’ve first appeared. They also know the subjects of my artworks, such as “To be or not to be,” a Frosted Flakes cereal box, an American flag, or a map of the USA. I am inspired by the idea of others looking for, caring about and finding all the hidden and secret messages I put into my creations. Note: Michael, guest artist at this year’s dinner, is the author of An Artist’s America, which was published by Henry Holt and Co., LLC in 2008. Jack J. Schrier - The name of the award says it all. Miranda McMua, named in part for the character whom Cynthia Nixon portrayed on a HBO show about life in New York City, is once again thrilled to make an appearance at “Recycling: A Metamorphosis.” In keeping with the dinner theme, Leeza Tea Coco Chanel, MCMUA designer in residence, has garbed Miranda in a stunning outfit resembling a monarch butterfly. Carson and Gebel Ribbon Co. in Rockaway donated the ribbon from which Leeza Tea made Miranda’s black and orange ensemble. The following description was provided by the Community Food Bank of New Jersey. It is possible that a bag of bagel crisps can make a difference. A concept that began with one woman distributing groceries out of the trunk of her car has since grown to a charity that has distributed close to 400 million pounds of food and groceries valued at nearly a billion dollars. 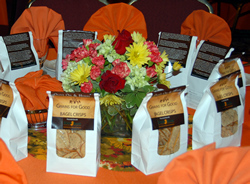 Grains For Good is a new, revenue generating venture of the Community FoodBank of New Jersey whereby donated bagels are turned into bagel crisps as part of our Food Service Training Academy curriculum. Culinary students prepare and package our bagel crisps for sale in farmers markets and specialty stores. 100% of the proceeds of each bag of Grains for Good are donated to CFBNJ, which distributes over 33 million pounds of food and other groceries in 18 New Jersey counties annually. By believing in the possible rather than the impossible, the Community FoodBank of New Jersey has been delivering food and hope in equal measure to New Jersey communities for nearly 30 years. Please visit www.njfoodbank.org/GrainsForGood for more information on how you can get involved in the CFBNJ’s fight against hunger and poverty. The musicians - For the 16th consecutive year, Shot of Redemption is providing live music. To book them for an event, call 845-255-3177. Gently used designer handbags such as the blue Dooney & Bourke bag modeled this evening: Taylor’s Consignment Shop, Morris Plains, 973-267-1919, www.taylorsconsignors.com. Aprons with large pockets for holding clothespins or one-of-a-kind handbags made from boots, costume jewelry and other “found” materials: Donna Bangiola, 973-292-3562. Blue Q (“Experiencing Metamorphosis since 1988”) tote bags made with 95% recycled woven plastic from used grain sacks: Whole Food stores or www.blueq.com. Brightly colored door mats made from flip flop material: Bed Bath and Beyond, www.bedbathandbeyond.com or contact medici 888,1431 Baker Road, Virginia Beach, VA 23455. Purina® Yesterday’s News® brand cat litter made with recycled paper and sawdust (and supposedly it’s more absorbent than clay, gentle on sensitive paws, generates low dust and low tracking, has effective odor control, and the empty bag can be recycled with mixed paper): Pet supplies section in supermarket, bodegas (for city dwellers) or wherever. Vinylux products (the bowl into which Fritos might have been poured) created from vintage record albums: www.vinylux.net. Books such as the green book, the EVERYDAY GUIDE to SAVING the PLANET ONE SIMPLE STEP at a TIME and The Audubon Society Guide to Attracting Birds, Creating Natural Habitats for Properties Large and Small (Mendham books donated a copy of the latter to be given as a door prize). Please support your local independent book store: one in our area is Mendham Books, Mendham Village Shopping Center, Mendham, 973-543-4949, www.mendhambooks.com. Posters featuring Michael Albert’s artwork: www.michaelalbert.com.